The Mini Server Environment Monitoring System monitors critical environmental conditions (such as temperature, humidity, and water leakage) that could destroy network components in your server room. When a sensor exceeds a configurable threshold, the system will notify you via email, SNMP traps, web-page alerts and a visual indicator (red LED). Optional industrial mini server environment monitoring system for high temperature environments. This industrial system has the ability to operate and monitor in harsh environments at high temperatures up to 167°F (75°C). 1 screw terminal pair for connecting liquid detection sensor. Additional water detection sensors can be connected to the dry contact closures. Four screw terminal pairs for connecting dry contact devices. One female RJ45 connector with LEDs. Operates and configures via SNMP or HTTP web page. An IP address can be assigned to the ENVIROMUX-MINI automatically by a DHCP server. Email alerts can be sent to three addresses. Generates SNMP, email log, and syslog messages. Four users can access the Web interface simultaneously. ENVIROMUX-MINI: 32°F to 100°F (0°C to 38°C). ENVIROMUX-MINI-IND: 32°F to 167°F (0°C to 75°C). ENVIROMUX-MINI: -20°F to 140°F (-30°C to 60°C). 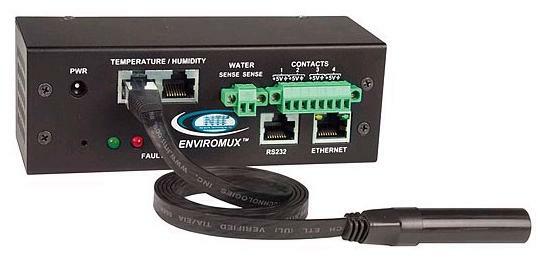 ENVIROMUX-MINI-IND: -20°F to 185°F (-30°C to 85°C). Use the PWR-48V-5V1A DC-DC power converter to install the ENVIROMUX-MINI in a Telecom environment. All sensors connected to the ENVIROMUX-MINI can be viewed on one summary page. View/edit entries stored in the system data log. Up to four users can access the web page at one time. Download new firmware and MIB files.